I saw a big cardboard box for this unspeakably horrible thing in our building's basement trash room this morning and shuddered with palpable contempt. Our kids aren't quite old enough to grasp the whole concept of Christmas as yet, so it's not like they've been hitting me up with prezzie-requests (this is ultimately a good thing, what with Daddy being out of a job at the moment and all), but I know that day is coming very soon. Suffice to say, I'd sooner procure my daughter this than ever buy her a life-sized talking Dora. But it's a slippery slope. Meanwhile, have you ever have one of those days when you wish the Earth would open up and swallow you whole or that a giant, 16 ton weight would fall from the sky and crush you the way they used to do in Monty Python's Flying Circus? Well, I had one of those yesterday. Y'see, at some recent point, we inherited a rickety old tricycle from a friend. For months, it lived in our front room, wherein I proceeded I stub my toe against it repeatedly. It wasn't until fairly recently that Charlotte actually started taking an interest in it. It took a while, but in relatively short order, she managed to get to a level of proficiency with it. There was still a lot of wobbling and whining and helpful pushing involved, but she was truly starting to get the hang of it and needing assistance less and less. Yesterday morning, we decided to attempt to defy the chilly winter grey with a trip to the playground, and at the last minute, Charlotte insisted that we take the tricycle along with us. It all went downhill from there. When we got close enough to the playground, Charlotte assumed the tryke and started peddling towards it, albeit in a vaguely serpentine fashion. Because I'm such a whiney neurotic, I usually frown and roll my eyes at the notion of bringing things like the tricycle to the playground, as they're pretty much an invitation to conflict. Being that the concepts of "sharing" and "ownership" are still somewhat nebulous to three year olds, what invariably will happen is that some other little person is going to eye it the second Charlotte steps off it and grab it for themselves, and drama will summarily ensue. And let's face it, I hate the damn thing. There, I said it. So, anyway, we entered the playground to find it absolutely empty. Either we were very early, or we were the only parents foolish enough to let our kids run around in the cold. Regardless, Charlotte immediately deduced that she wanted to go on the swings, so she peddled towards them accordingly. When she reached her destination, however, she somehow misjudged the distance and found herself awkwardly tangled between the tryke and the swing, with her foot painfully snagged between the pedals. I dutifully rushed over to extricate her. With Charlotte safely liberated from the clunky tryke, she assumed the swing. In a fit of pig-headed pique that had frankly been bubbling under all morning (probably the result of too much coffee and not enough breakfast), I foolishly acted on my ire towards the tricycle and literally tossed it over my shoulder. It landed behind me with a clanking crash (much to the wide-eyed shock of my wife standing nearby). Somewhat predictably -- although it didn't dawn on me while I was doing it, like the moron I am -- I managed to break the tricycle. The thin metal fork that held the front wheel had snapped like a graham cracker on impact. I immediately felt like an insufferable jackass. 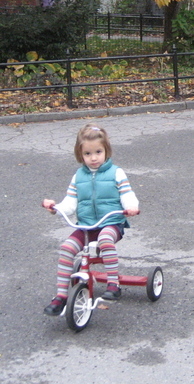 When little Charlotte discovered that her tricycle was broken, she was mortified. My wife, meanwhile, was visibly -- and understandably -- furious. I don't think I could have possibly felt worse about myself. I struggled to mend the wounded tryke, but it was hopeless. We stayed in the playground until both of our kids started feeling cold and repaired back inside for lunch. Still feeling like the worst person alive, I stepped out during the kids' nap-time to attempt to rectify the situation. My first stop was the new Toys 'R' Us Holiday Express that used to be Tower Records. The notion of shopping for toys in the space where I'd formerly procured vast swathes of my music collection would have normally been an anathema to me (my friend and former boss recently had to stop in there for a round of X-mas shopping and similarly remarked with a derisive shudder, "there are dolls in the jazz section! "), but I was desperate. I strode to the back of the store to find nothing but crappy BMX's and cheap-o Big Wheels -- not a tricycle in sight. I asked a clerk, and he looked at me like I was complete bonehead. "What'dya call those?" he said, pointing at the bicycles. I considered staying and correcting him and/or bludgeoning him to death with a life-sized talking Dora, but I had a new tricycle to find. I zipped out of Toys 'R' Us and hot-footed it to K-mart on Astor Place. Clearly, I was being karmically punished for my admittedly thoughtless crime, as there is truly nothing I enjoy less, with the possible exception of wisdom-teeth removal, than going to K-Mart. But, again -- I was determined to do this. I raced down to their lower level and darted around the sickly maze. I came to a skidding halt at a row of garishly colored mini-bicycles, but still not a tryke in sight. I doubled around, racing through the toy section, but found only Dora's hateful mug laughing at me at every turn. This was strike two. No tricycles at K-mart. Spat back out on Astor Place, I started to worry. How was I going to find a tricycle and why are they so damn hard to get ahold of anyway? I raced up 4th Avenue, hoping to find something on Union Square. I briefly stopped into Babies 'R' Us, but they had nothing for children over the age of two, so that was a lost cause. Now I was really despairing. Then I remembered that bike store on 6th Avenue and 15th Street. I raced west. I must've staggered into 6th Avenue Bicycles with the look of a man in need, as the dude behind the counter was instantly concerned. "Tricycles?" I asked, between gasps. "Right over there," he said, pointing to a lone, blue and frankly flimsy looking thing that would never in a million years solve my problem. I told the guy -- a very understanding gent named Noah, as it turned out -- about my plight. "Ah, you want the classic tricycle! The red and white kind, right?," said Noah. He picked up the phone and dialed a number while I stood fidgeting. Noah started chatting with a guy in a warehouse somewhere. "Hey, Steve? It's Noah on 6th Avenue. Do we have any more of those Tricycles? Y'know -- the Radio Flyer kind?" My hopes started spiraling upward. "Dude, I can go pick it up myself if they have one," I hungrily chimed in. Noah looked at me and mouthed the word "WESTCHESTER" and I cooled back down. It would be a couple of days, at least. 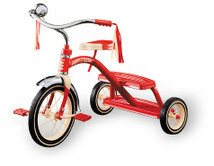 To make a long story short, I decided to order a classic red & white Radio Flyer model tricycle for my little girl. I know it doesn't excuse my self-centered, thoughtless action of yesterday, but I'm more haunted by the sight of Charlotte's tearful little face upon discovering her broken tricycle than I can possibly put into words. If this experience has taught me anything, it's that no matter how much I may think that parenting has changed me, I'm still ultimately fallible and still entirely capable of being an abjectly self-centered jerk. Clearly, I've still got lots to learn. I LOVE your writing - I know this isn't a happy post to react to, but it's written sooo well, I had to. Thank you. You know me, and I don't say this often - or at all, really - but my heart is breaking.